about those big box stores and the plants they sell. It was not my intent to save a life. I was merely there to find a suitable pot for herbs for my window sill. As I walked through the parking lot toward the entrance of Home Depot, I was surrounded by displays of plants and trees and bushes set out for a "Sidewalk Sale". "It's too hot!" I said to myself. It must have been 95° or more as the sun reflected from the asphalt. The sunshine that our part of the world has eagerly anticipated through our damp cold Spring is now arrived in full splendor. I quickened my pace to reach the store entrance and the cool air that surely would be inside. I seriously felt as though I were walking through a battlefield as I viewed the desperate condition of the many plants. I imagined I could hear their faint voices calling out to me from their pots, "Help me, help me" in quiet desperation. I was quite disturbed with the thought that these plants were struggling to survive and so I tried to focus on the entrance of the store rather than the hundreds of neglected plants who seemed to be on their last leg of hope. It is disturbing to me that these big box stores give minimal care to their offerings, these plants were in dire need of water. As I made my way through literally hundreds of visibly stressed plants, my eyes focused on a table filled with delicate pink flowers... Gaura! that bloom throughout the summer. remind me of fireworks on a summer night. 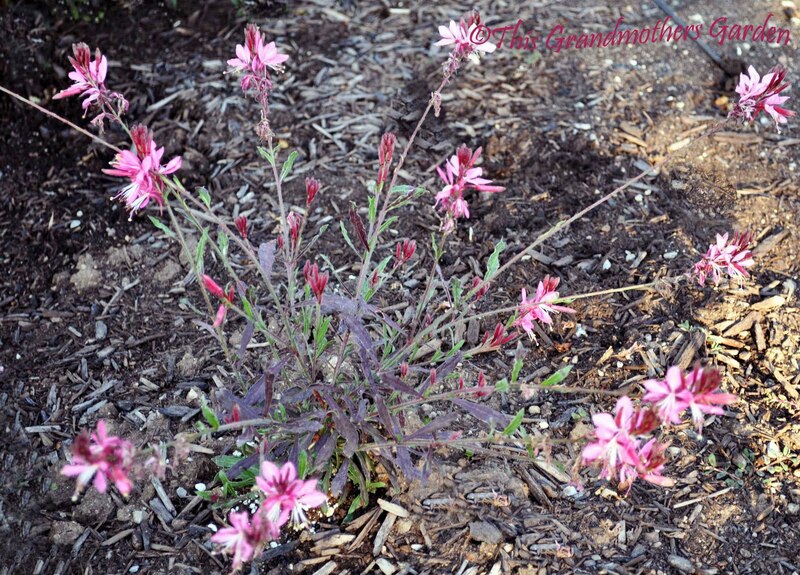 I first fell in love with Gaura in the Spring of 2009. It was love at first sight! Without hesitation I purchased six of them with no thought as to which zone they were best suited for. (Such is the effect of new love, your mind turns to mush and all reasoning is far removed.) They were a beautiful addition to my garden! They didn't survive the winter. No wonder my eyes were drawn to them this hot summer's day in the parking lot of Home Depot. There were several dozen potted Gaura's on the table. All of them in gallon nursery stock pots with very dry soil. 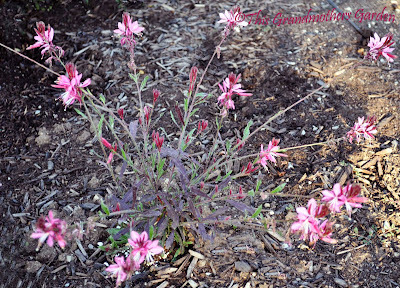 Gaura tolerates drought and heat well so these blooms didn't look as forlorn as some of the other surrounding flora. Before I knew it I had picked out six of the more promising looking Gaura plants and set them in my cart. $5.47 times six. That was more than I had planned to spend. Suddenly, Deja vu entered my mind. Deja vu as in the cognitive realization of something that has already happened. "This is the same store that I bought them from last year. I almost said out loud. My mind began to reason that despite the un-budgeted price, I was fully justified to purchase these plants. First of all, I really really love this plant. Secondly, there were six empty spaces in my garden that still need to be filled. And last and most prevalent in my love sick silly head, I'm not only making a purchase, I'm saving a life. Heck! I'm saving six lives! I proudly wheeled my cart into the store and took my place in line to make my purchase. That's when the smarter portion of my brain began to interfere: "You're going to spend over $30 for plants that will only last for a summer?" The love-sick silly portion of my brain quickly chimed in again: "But you are so in love with Guara, besides, their death is almost certain if you don't rescue them from this dire place! I let the two sides of my brain battle it out as I advanced in the checkout line. Finally it was my turn. I was still trying to justify this unplanned purchase. The checkout lady was an older woman who immediately exclaimed, "Oh I love these! They are one of my favorites! 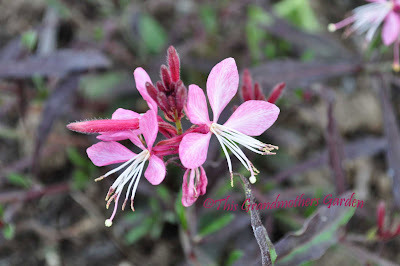 As she searched for the price tag I offered the comment: "I planted Gaura last year, but they never came up this Spring. I thought they were perennials. I guess not in Zone 5." She looked at me with concern. "They are perennials. Did you purchase them here?" I nodded that I did. "Home Depot guarantees all their plants for one year, my dear," she said as she scanned the tags. My heart leaped. "You take this receipt right over to Customer Service and they will give you a full refund." My heart did somersaults! "Really?! They will do that?" "Absolutely! You have a wonderful day!" she said with a smile as she handed me the receipt. And so I did. I marched right over to Customer Service, receipt in hand and six Guara's in cart and politely asked for my refund. There was some discussion, apparently they want the dead plants as proof of your loss. I could provide that, as I had left the dead sticks from each plant in place in my garden still hoping that they would show signs of life. However, the thought of going home, digging up the plants and returning on this hot day was more than I could bare. "Could you possibly waive that rule this time?" I found the courage to ask. "I suppose we can, but next time, remember to bring the dead plants with you." I watched with delight as the clerk put the dollar bills and change in my hand, not quite believing the reality of my good fortune. I left Home Depot with a smile on my face, money in my pocket, and no care in the world as to whether Guara will survive in Zone 5. My receipt is carefully tucked away in my gardening book, so that next Spring, should these little beauties not emerge, I'll simply return to the store, purchase six more, and with dead plants in tow, ask for my refund. 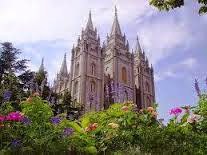 where it receives plenty of water, sunshine and adoration. as I pass by each morning. and received a bounteous reward for doing so. Ah-h-h... who could ask for anything more? Fun story, those are very pretty, lucky you! I loved your story, that was funny. And you're lucky, to receive money without having your dead flowers. bravo. 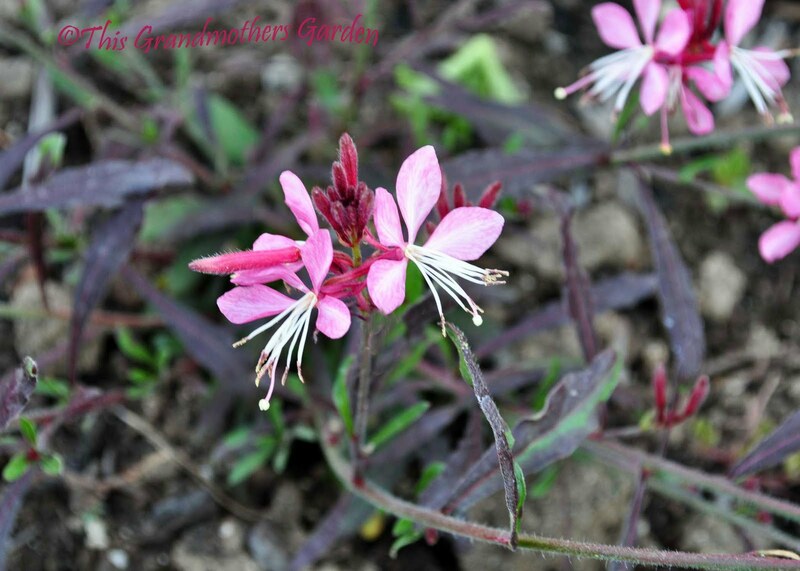 Your Gaura is beautiful, I also love pink! Thanks for the sweet comments. I hope more butterflies will come around again. I always see bees and hummingbirds in my garden too but they're too fast for me to capture a picture! Home Depot, Lowes, Walmart all will give you a refund for plants that die in the first year. I myself never think about it so never take them back but maybe I will IF I can find that receipt. I am gonna try to find anotheer Souvenirs de Fleurs a book that my sister gave me right before she passed away. It is a garden journal with sleeves for pressing flowers. I could put the receipts in there. I adore Guara, too. I have one that is three or four years old. It's a much paler pink than yours. How wonderful that you were able to get that refund! I have bought the majority of my plants at Lowe's - and many of them on the discount rack. I've had great luck with them. I went to the local garden center and their plants didn't seem as well cared for as those at Lowe's. Maybe we have an excellent garden center manager at our store. I work in a non-garden retail store, and that's jus the kind of customer service that we provide. Yes, we may lose out on returns like that, but the goodwill created is endless as you know! A lovely thought, saving 6 lives! 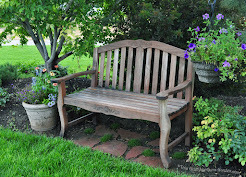 Thank you for visiting my site ... a joy to visit yours too. Sweet story, Carolyn. :) I'm so glad you could give those beauties a place in your garden and your heart. It sounds like you have a similar love affair as I do, thankfully they do survive in my garden though and my collection is slowly but very surely growing each year… Just this spring I bought another two and have managed to get my mum hooked on them too! That's such a cute story! Goodluck with your lovely Gauras. This just goes to show that if you do something good like deciding to care for sickly plants, something good will bounce right back into your life. Good Job! Great story! We lived in Colorado for a couple if years and there is nothing like US customer service! The thing is, a little bit of generosity in the refunds department makes people much more comfortable about spending in the first place! That's a nice story. I love those cute flowers! I always forget they do that! It lessens the pain of losing some precious plants for sure. Maybe these will survive tho ~ you never know?!! They are beautiful and very tough. Glad you saved six lives! I always say I'm doing that too, especially when I rescue them from the clearance section. I bought a Gaura lindheimeri cultivar yesterday at HD. 'Chiffon Cloud', the first one for my DC area garden. 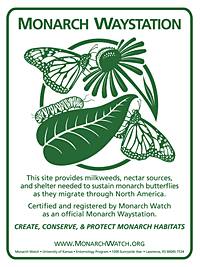 I had two when I lived in AZ, and they were the most beautiful plants in my garden. Good luck with yours! Thank you all, for your sweet comments. I enjoyed reading every one! I'm glad you enjoyed this post!